I love knitting. I don’t take near enough time to do it, but as the weather gets cooler and I’m spending a bit more time in front of the tube, I need to have something to keep my hands busy- knitting is the winter winner! 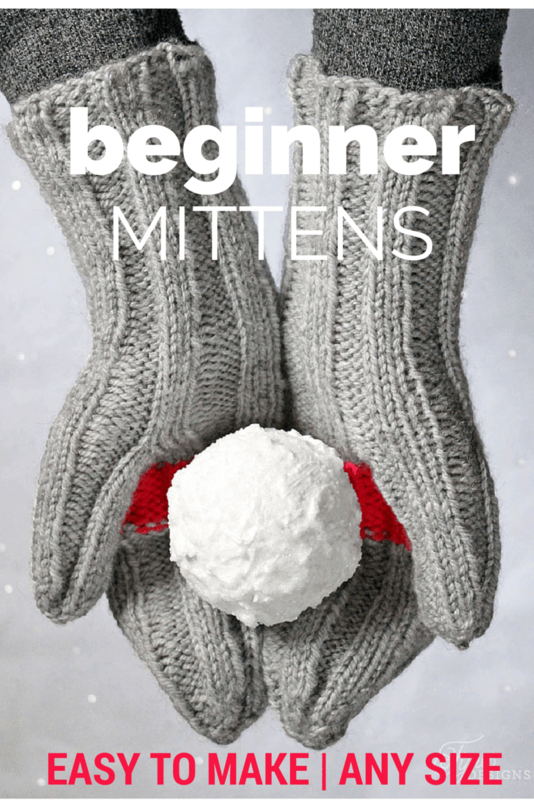 This free mitten knitting pattern is a favourite of mine I learned from a good friend in college. 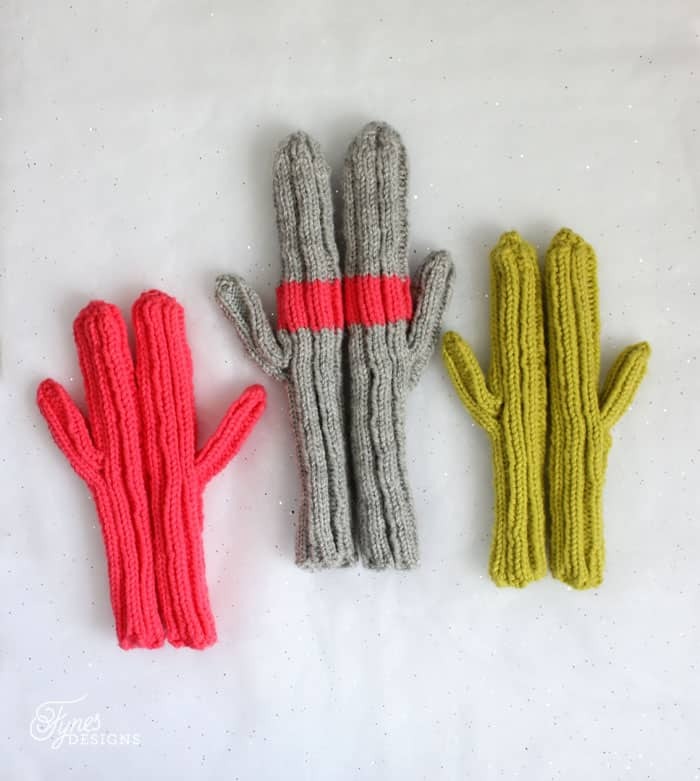 These cactus mittens are perfect for beginner knitters. There isn’t any increase or decrease stitches throughout, just as you finish off the mitten. 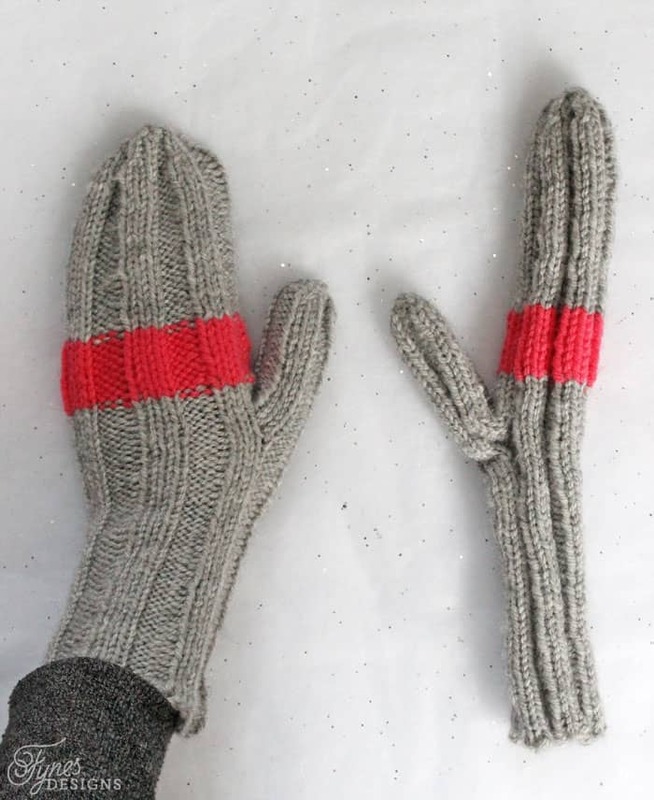 It is a great project for getting a handle on how mittens shape, and learning to use double pointed needles. Plus one simple pattern is easily changed to suit all hand sizes, big or small! 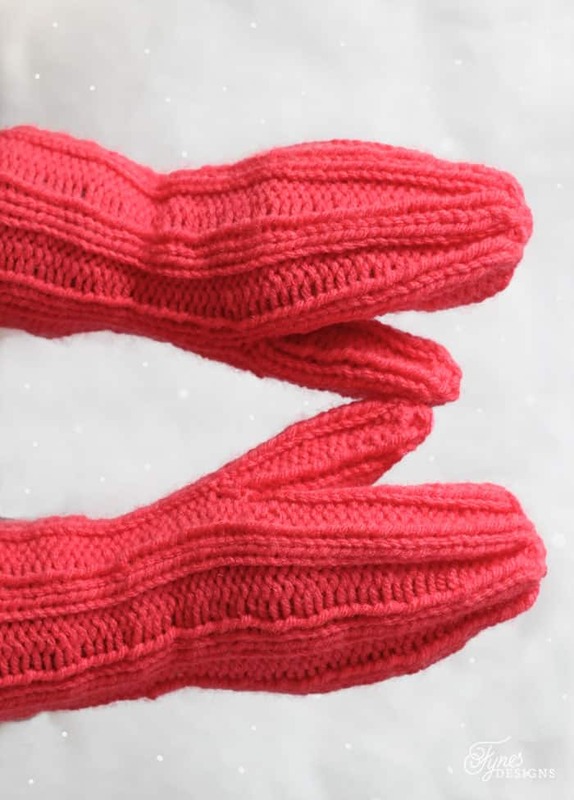 You can adjust the length of the mitten according to the size of the individuals hand. The pattern below is for an average size woman’s hand. Drop 6 stitches onto holder, cast on 6 stitches and continue in K3, P3 ribbing for and additional 5″. Clip yarn and draw through remaining stitches. Tie in a knot on last stitch. Sew in loose end on inside of mitten. 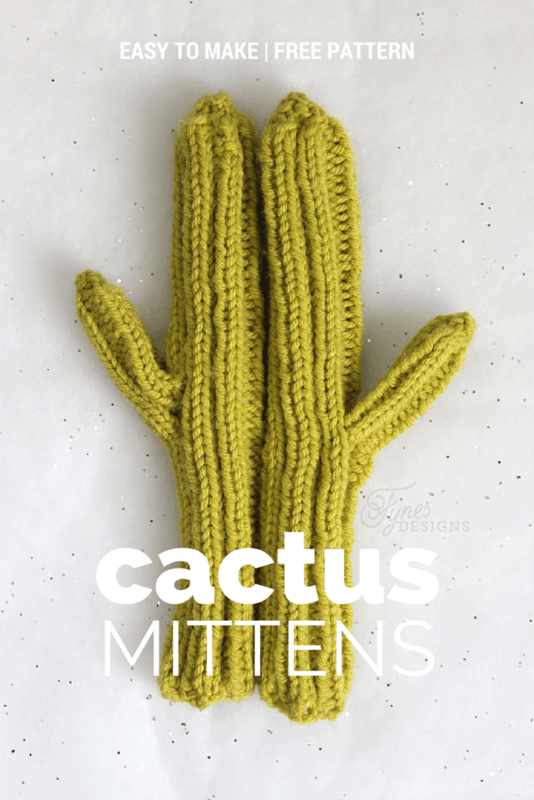 These cactus mittens look kinda silly off, but they are much more compact than traditional mittens to fit in a pocket, and stay nice and snug to your hand. I like to make the wrist a little extra long to stay up inside a child’s sleeve better. This free knitting pattern is perfect to get you started on making your own winter gear! Stay warm, it’s getting chilly fast! Thanks again to my friend Crystal and the grandmothers of the Miramichi for sharing this fun pattern with me, it is always one I come back to! Thank you soooo much! I can now move beyond knitting dishcloths! Awesome Claudine, These mitts are super easy, perfect for all age kiddos! Thanks for this pattern. I am passing it on to a couple others gals as well. I’ve never seen a pattern written like this before, cast on 12-12-12? Read it several times, do you mean 12 on 3 needles? Double Points aren’t generally a beginner tool, with casting on 36 would think you could do them on circulars? But then thinking of the later decreases, probably would have issues? Then when you say drop 6 you don’t indicate, but I wondered, does it matter which needles you drop from? And do you need to mark things somehow so you’re able to match the 2nd one? Are you dropping six and casting on six to the same needle? Then later when you pick up the dropped six and add to it, are casting on to add, or making one method? Hi Sandy, I’m sorry you’re having trouble with the pattern. I don’t typically write patterns, but I did learn this one as a beginner, so I have faith you can figure it out. 12-12-12 means 12 stitches on each of the 3 needles. It doesn’t matter which you drop from because the pattern is the same from the wrist to the finger tips, I generally just measure from the writs. Yes drop 6, onto a holder or safety pin, then cast on 6 new ones, and pick up the additional stitches from around the hole that is left for the thumb. Good luck, please let me know if you have any other questions. I am a beginner and am having trouble understanding some things. So, do you need 3 different skeins of yarn? One for each needle? How do you knit with 3 needles that all have yarn on them? I’m not sure that I can figure this out on my own. May need to have to have someone show me (in person, pictures or video) how to do all of that? Fantastic pattern, thank you!!! I can even work an afterthought thumb on these and it is working out perfect. Happy knitting, bless you. So glad you can use it Helen! Thanks for visiting! I’m about ready to try out your pattern and I was wondering about skeins of yarns. You say you only need one but what I’m wondering is how many meters/yarns in the skein do you need? So do I need to get a large one or will a smaller one work just fine? I use circular needles, because I don’t how to use the others. Do u recommend it? I’m not great with circular needles but I think they’d actually be better with no seams. I started knitting these mitts. They look awsum but you said cast on 18 on each needle for adults. They are looking pretty big! Are they a bigger fit? I’m thinking of starting over with the 12 on each needle. Yes, 18 are for mammoth hands, if I were making the for me I would do 12. Sorry, I should edit that.